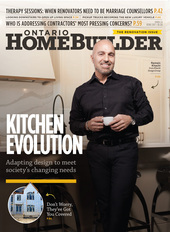 With living spaces getting smaller and consumer habits shifting, the dining room is becoming the chameleon of new home design, says Ramsin Khachi of Toronto’s Khachi Design Group. With homeowners embracing open-concept layouts and large primary living spaces, the dining room’s role is changing to adapt to lifestyle trends such as in-house entertaining, multiple cooks and more casual living. Does that mean the room once dedicated to holiday entertaining or formal Sunday dinners has become a relic of the past as square footage shrinks, lifestyles get more casual and homebuyers embrace open-concept floor plans? Yes and no, suggests Khachi. Friedemann Weinhardt, founder of residential interior design firm Design First in Ottawa, says while many people are forsaking formal dining rooms in favour of more casual eating spaces, they still want a place to put a dining table. The dining room still exists, he says, but there are no longer any walls around it. With detached homes getting smaller, and townhomes and condominiums becoming popular due to affordability, the integration of a dining area with the kitchen and family room into one large living space continues to trend. the majority don’t want a separate dining room. The dining room, in many cases, has been rendered obsolete by builders themselves, suggests Weinhardt, who notes that several tract-built homes include dining room footprints too small to allow the room to function properly. “A lot of them aren’t big enough to be able to pull out chairs on both sides,” Weinhardt notes. While he notes that big buffets and sideboards of the past have also gone the way of the dinosaur, it’s important to have enough space to provide storage for items such as extra dishes. “We do a lot of built-ins,” Weinhardt says. Another casualty has been the breakfast nook, which, in most houses, was too small to be practical, says Weinhardt. “It has been replaced by an island where people can sit at stools,” notes Goodwin. And goodness knows, everybody wants an island. Rinaldi says this integral part of the modern dining lifestyle reflects the trend to more casual living—people want guests to be able to gather around the island for parties. “When we’re doing renovations, people say, ‘Give me a big island,’” relates Patrick Ryan of AyA Kitchens, which has showrooms throughout the province. “They congregate around the island, even if people are cooking. And if they have the space, they want an island large enough to seat at least four people.” In big homes, the island might be large enough to accommodate a dozen. Ryan says islands have gone from small and utilitarian to centrepieces, resembling “something you might find at an antique store” or decked out with Canadian-made, FSC-certified veneers that resemble exotic woods such as wenge or zebrawood. AyA also gets requests to integrate a dining table with the island that can be used for both casual and formal dining occasions. And many are opting to put a “show-stopping” chandelier or pendant lights over the island, just as they may have done over the dining room table in the past, Ryan explains. Not so much for condos, where there is often not room for a designated dining area. That’s when space has to be even more versatile and functional. “You can have a table that can pull out from the island and slide back in when you’re not using it,” advises Goodwin. Evolution means there’s also the continuing opportunity to reallocate space previously devoted to separate dining rooms for such things as main-floor laundry rooms or home offices, giving those regularly used parts of a home greater functionality and room to breathe. And with smaller homes continuing to be the norm in large cities, expect further innovation from manufacturers to meet the needs of homeowners. “I think you’ll see more retractable or subtle partition designs and ideas, spaces that transform in use, creative hardware that enables that transformation and more creative furniture designs that will also facilitate it,” Khachi predicts. Goodwin says where dining areas are part of an open concept, there should be some indication that “this is the space where we break bread together.” This can be achieved in several ways, she says, including a statement light fixture, a ceiling treatment (such as beams or a waffled ceiling) or an area rug. That can be a little more challenging in a smaller space, though, as it’s hard to determine “where to start and end the detailing,” she notes. Even with the popularity of dining out and compact condo living, Weinhardt says a space for dining remains important.